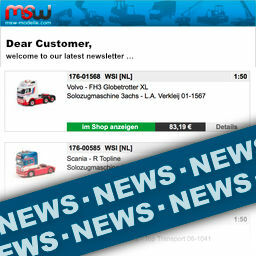 Notre newsletter vous informe sur les nouveaux produits et les recommandations actuelles. Abonnez-vous à notre newsletter gratuite et nous vous tiendrons au courant des plus récentes et les plus grands modèles de véhicules. We take the protection of your data seriously and would like to avoid misuse of your e-mail address. Therefore, after clicking on "subscribe" you will receive a confirmation email from us first. Please click on the confirmation link within the next two weeks, otherwise your registration will be deleted automatically. You can terminate the subscription at any time in the future. For your convienience we'll include an "unsubscribe" link at the end of each newsletter. If you enter optional personal data such as title or name, we'll use them only for the newsletter. Should the confirmation mail not appear in your inbox within the next hour, please check the advertising/spam folder in your email program. Maybe it ended up there.